i am so happy with how this recipe eventually turned out–because the first attempts did not. 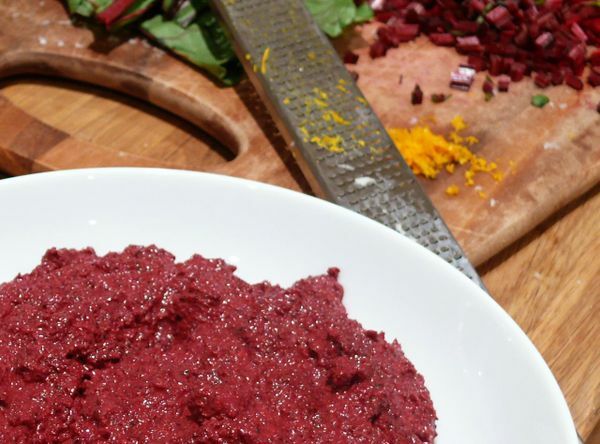 the first beet pesto i made was more like a…paste. it may have tasted good, as my kind dinner guests assured me, and one of them made a good point: “this would be a good ravioli filling.” true. but not what i was going for. i’ve learned that pureeing roasted beets with ricotta creates the kind of sponge that no amount of oil or water will loosen up. but enough with the failed attempts–and on to what ended up being a dinner party-worthy dish. i will have to have those guests over again to try this, asap. raw beets this time, make the base of the pesto. i’ve been hearing lately that garlic-intolerance is more common and this pesto has no garlic, yet tons of flavour. i used all parts of the beets in this dish, saving the stems and leaves and sauteing them as a bed for the gnocchi. the gnocchi is not boiled, but added straight to a pan of sage and browned butter to fry until golden. but what really elevates this dish and makes me super-happy about it is the orange butter sauce. the inspiration for this whole dish was two dinners i had last summer at delux and grace on the west side (sniff…i miss you west side). at delux i enjoyed gnocchi with a sweet red puree, which was the inspiration for the beet pesto, and it was served with a sweet sauce as well, with flavours that i couldn’t place and for some reason didn’t inquire about. but shortly after that, i enjoyed a truly perfect ricotta ravioli (the reason i used ricotta in my first stab at this), at grace, and it was served in a browned butter and orange sauce. i tried to combine all of the flavours of those great dinners in my version, and i think it totally worked. the sweetness of the beets and orange play off each other without being over-the-top sweet. the orange seems to highten all of the other flavours like salt would, so it’s defintely worth taking another two minutes to make the orange butter sauce. i hope you try this and enjoy it as much as i did. 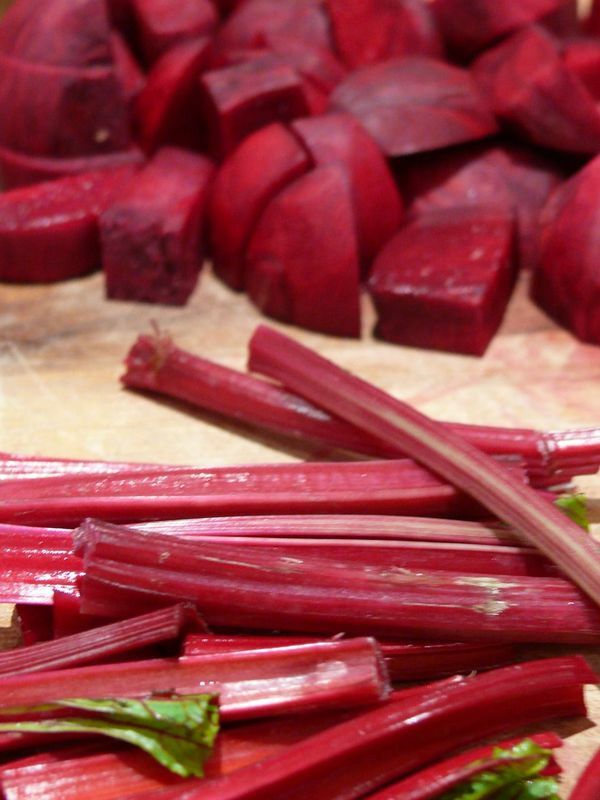 if my dinner guests from the beet-paste trials are reading this–round two at my place any time! puree all ingredients in food processor, adding half of the oil immediately and the remaining slowly while pureeing. puree until completely combined and creamy. stir and then leave covered or in food processor until ready to serve (the exposed surface will darken slightly, so stir again prior to serving). can be made ahead and kept in fridge for a day or two. bring to room temperature before serving. heat 1 tbs of oil in a large, non-stick skillet over medium-high heat. add garlic and beet stems and saute for 2 minutes. add beet greens, a generous sprinkle of salt and pepper and cook until the beet greens have started to wilt and have changed colour (do not overcook). 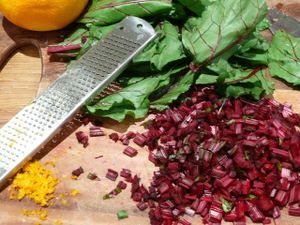 transfer beet stems and greens to a bowl, discard garlic, wipe out pan and return it to the heat. 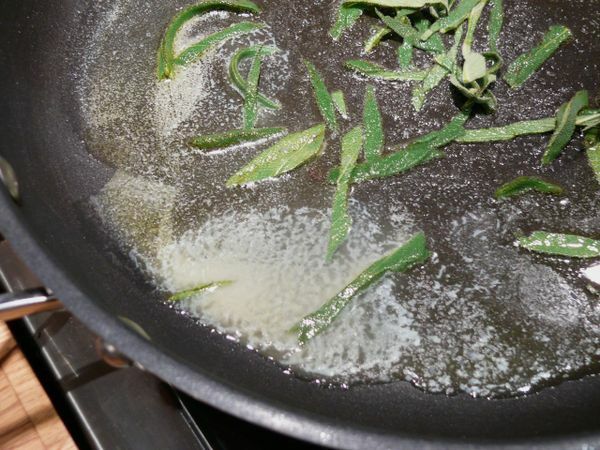 add 1 tbs of oil and 1 tbs of butter to the pan and when the butter is melted, add the sage leaves. 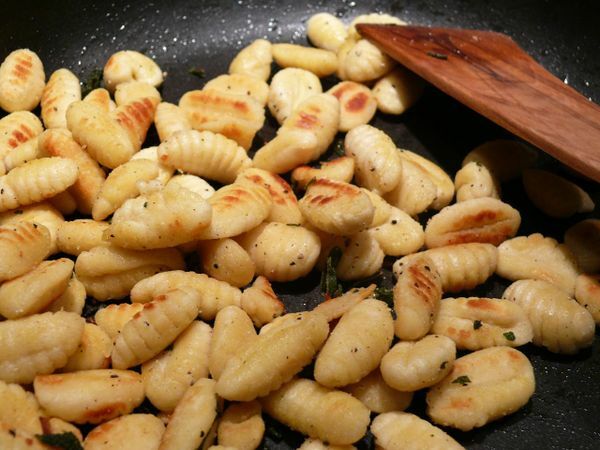 when the butter is browned (when the froth has subsided and the colour is slightly browner) and the sage leaves are fried, add the gnocchi with a couple of pinches of salt and a sprinkling of pepper. fry until the gnocchi is golden and a slight golden crust forms on both sides. transfer all to a bowl and return pan to the heat. add remaining tbs of butter to the pan and a big pinch of salt. add orange zest to the pan. when the butter is melted and browned, add orange juice. cook for a minute or two until sauce has slightly thickened and reduced. pour a tbs or the orange sauce just to the side of the very centre of the plates. 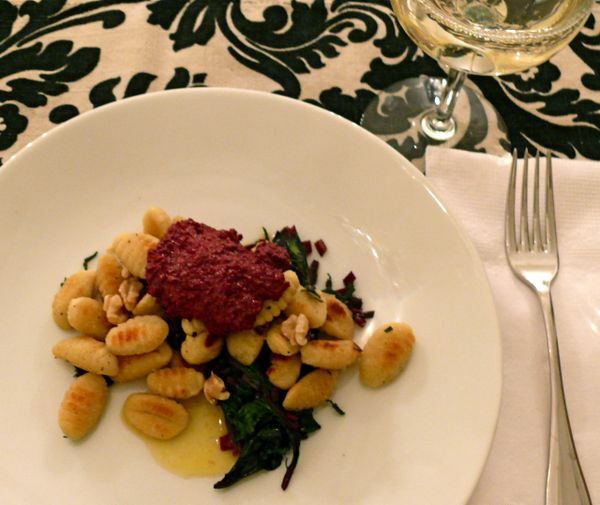 toss beet greens and stems and serve a quarter of the mixture beside the sauce on each plate, making a well in the middle for the gnocchi. place gnocchi on top of both the sauce and greens and stems and sprinkle with chopped walnuts for garnish. top with a large dollop of beet pesto and serve immediately. Seriously one of the best meals I’ve ever made! Thank you! you made my night, thank you! im so glad you liked the recipe.